Good evening :) I spent the day at my Sister's today for my Niece's 13th Birthday. The sun was shining and we spent all day outside. My daughter had heaps of fun playing with the pet rabbits, jumping on the trampoline and playing with her cousins. 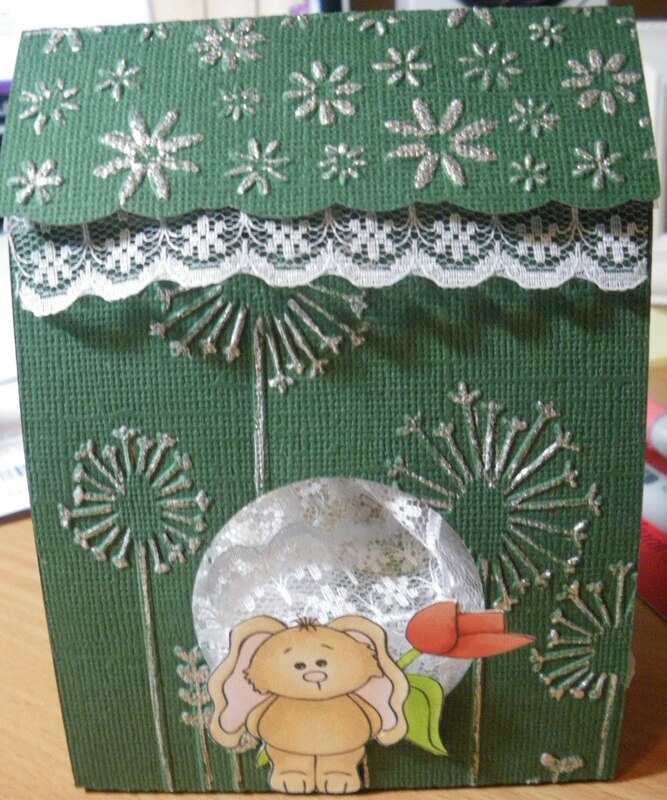 I have created this little gift bag tonight for a special young girl who adores rabbits and the colour green. She will love this little bag and I'm going to pop some craft bits and pieces in there ... mainly punched out images, a bit of lace, and some paper flowers. She wants to make cards! So I thought I would help get her started. I have made one of these bags before and was really happy with how it turned out. You can use punches or dies to get the scalloped edge and the circle in the middle. So this time I thought I would add a bit of lace and some lovely silver glittery pen for a bit of glamour. The gorgeous little rabbit is a freebie from Sharing My Thoughts, and is one of the first digi stamps I ever coloured with copics. I really love this little rabbit and have coloured him a few times. Generally in these colours as I think he just looks so soft and cute. I embossed the bag using my cuttlebug and used a We R Memory Keepers silver pen on the raised areas. I used double sided foam tape to attach the top so it sticks out ... revealing the lace a little more. Thanks for stopping by :) I hope you had a wonderful sunny and happy day also. Carly this is exquisite. I love how you used the silver pen on the raised embossed areas-it looks smashing. 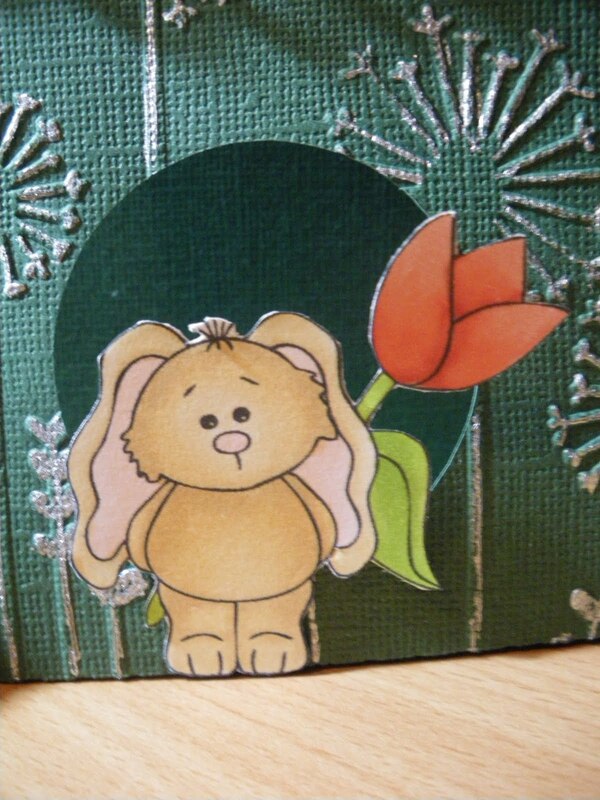 What a wonderful gift to give to someone starting out wanting to make cards. You are so sweet and thoughtful. Thanks so much for playing with us at Speedy the Cat's Friends challenge. It was a pleasure to come to visit and I really enjoyed what I saw! 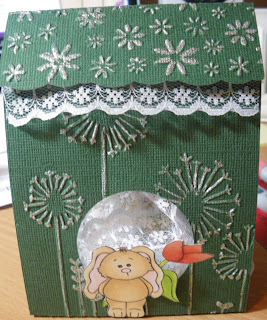 Such a cute project for a child! Thanks for sharing it with us at Send a Smile 4 Kids and come back soon! Oh my, what a cute bag!!!! I just love bunnies and this little image is so cute! You really did a great job with Speedy the Cat's challenge this week! Thanks for playing along with us this week at Speedy the Cat's Friends challenge. What an awesome gift bag! And what a fun thing to give to someone that wants to make cards! Thanks for playing with Speedy's Friends! Gorgeous gift bag Carly, fab image and I like the embossing. Hi Carly, what a sweet bag and wonderful of you get get someone else hooked on crafts like all of us! Hehe! =) Too funny! Thanks for sharing your project with us over at Send A Smile 4 Kids challenge. Good luck and I hope you will come back and play again with us! What a sweet card. I love the little bear and the color perfect (just happens to be my favorite). Thanks for playing along with us here at Speedy the Cat's Friends challenge this week. Hope to see you again next week. Gorgeous little bag and I bet she will really appreciate it! What a great way to enable young crafters ;) Thanks so much for sharing with us at Just Some Lines! Great Bag! Thanks for playing along at Just Some Lines!